Michael Faulk continued his streak of good runs with another strong finish at Ace Speedway. Faulk leads the Pro Cup Series rookie points. Northern division regular Mart Nesbitt was having a stead run going at Ace. But what does feel good for Faulk is the chemistry between he and his new mentor Mario Gosselin. Gosselin, who is a Pro Cup, ARCA & Super Late Model veteran driver, is one of the big reasons behind Faulk's recent success. “He's in the shop five days a week,” says Faulk. “Being a rookie in this series, the learning curve is huge stepping from Super Late Models to these cars. The transition has been made a lot easier by Mario. He's given me a lot of short cuts and a lot of things that I didn't know that he is teaching me so I don't have to learn on my own by stuffing it in the fence. That was until the seat in his #88 became the hot seat, literally. In a scary moment, Nesbitt's car burst into flames in turn one and two. Most importantly, he escaped the flames unscathed and wound up 24th on the final rundown. “Unfortunately we broke a fitting off the valve cover and it started squirting oil all over the headers. Just a parts failure and not anyone's fault. It knocked us out of the race and burned a bunch of stuff in the car. Nothing terminal though. Going into 2005, many viewed Steven Wallace's chances at Pro Cup Rookie of the Year as very strong. He had good equipment, a ton of momentum after winning the famed Snowball Derby (Super Late Model race in Pensacola, FL), and had a veteran wrench to lead the way. Shane Huffman overcame engine problems, having to change powerplants before qualifying and looked to have his day back on track. Everything seemed to be going well for the early season points leader. He was staying out of trouble, he led a few valuable laps and Clay Rogers wasn't having a great run. It was all going good until disaster struck in front of him. Jake Hogbood was battling with the leaders to stay on the lead lap and rocketed into the wall. 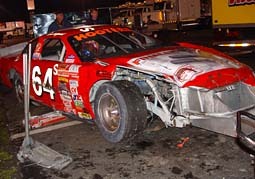 When Hogbood's racecar came off the wall Huffman had nowhere to go and slammed into the #64. 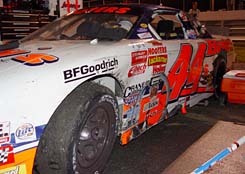 The collision ended Huffman's night and resulted in losing the points lead. Then Rogers had mechanical woes try and put him down. It looked as if the 44 team was back on track after the change and a smart-pit stop soon after that netted the team with some good track position. Clay Rogers #44 does battle with Bobby Gill (top, Kathy Bond photo) and at the race's end the battle scars showed. (bottom, 51 photo). Jason Sarvis was one of a handful of Hooters Pro Cup competitors that were critically vocal of Jake Hobgood after the race. “I got a good bite off of four and I outbraked him going into the turn,” said Hobgood about the contact with Sarvis. “Heck I was up to his left rear tire. I stuck the nose in there and he rolled off in the turn like it was normal and I was there. I hated to get together with him. Many felt Hobgood didn't belong racing so hard with the leaders. But Hobgood felt he was where he needed to be and was sorry that it turned out the way it did. “I know people might be upset but I didn't go out there to intentionally wreck nobody. “It's tough with no sponsors and financing. When you tear cars up like this and you have to do it out of your pocket it is tough. “Man that had to be one of the wildest races I've ever seen man,” said Garvey. “Man oh man it was wild. Jay and Lavendar ran one hell of a race. Jay could have done a lot of the moves I saw happening all night but he didn't. That had to be one of the craziest races I've seen in my life. Mark was sitting there hoping they would bump and he would move up and we were there behind McFarland hoping for the same thing. For Garvey it was nice to just bring his Jani-King #17 to the end of a race. Garvey came off a pair of DNFs that had the short track veteran scratching his head until Ace. “I don't really know what happened,” said a disgusted Huffman. “The 84 car got up into the 64 car. The 64 came out of the pits racing like hell. He probably should have been a little more courteous. He got up into the wall and shot straight down across the race track in front of us. I didn't have anywhere to go. That is the hardest I've hit in a long time. 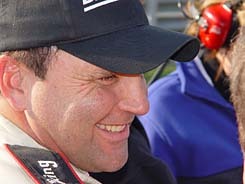 Veteran Cup crew chief Barry Dodson's reign on top of the box for Steve Wallace only lasted five races. 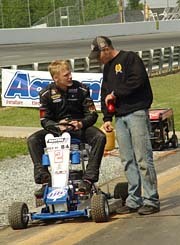 At Ace Speedway, Dodson was gone, a move that took many by surprise. “Barry has been a great friend of mine and the family forever” said Wallace. “Everybody loves Barry and worked well with him. There were some complications with Barry and the Busch Team. We are moving the Busch shop and in order for that to blend right and us to move into the Busch shop we had to get rid of Barry. him now to be honest. I've got two full time guys now. Barry is a good guy and we still talk all the time. It was time that we didn't need him anymore so we had to excuse him. Wallace came into his Hooters Pro Cup Rookie season with high expectations and has had a hard time meeting them so far this season. The new guy at the helm was Super Late Model Driver Jeremy Pate. 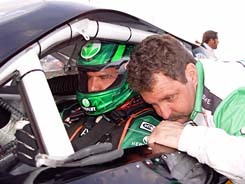 Pate and Wallace struck up a friendship at the Snowball Derby and have been inseparable since. Pate moved to North Carolina and works for Wallace and was the man, or one of three men, in charge at Ace. “Pate is the official crew chief I guess you would call it. We work good together. I'm really crew chief in a way. Its crew chief by committee I guess. It's Jason Poole, Jeremy Pate and me calling the shots. For Pate and Wallace, the new role worked out well and resulted in a strong 11th place finish. Clay Rogers was battling for the top-three spots with leader Mark McFarland and Bobby Gill in the early stages of the BFGoodrich 250. But that is when the trouble started for Rogers. But in a sort of strange twist, the same driver that Clay felt hurt their night also helped gain him the points lead. “Jake pretty much destroyed our race but I guess I have to thank him. I guess he ran himself into the wall and wrecked Shane Huffman. So now a seventh-place finish isn't so bad because it helped us in the points. That isn't how you race though. Everybody expected emotion from race winner Jody Lavender. He just won his first Pro Cup race. Plus, he did it in style, winning in a classic-photo finish by inches. But Lavender never though he would celebrate the way he did. 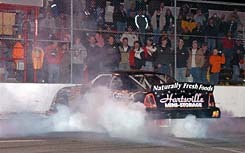 Jody Lavendar burns out for the fans at Ace Speedway after his win. (Kathy Bond photo). Brad Rogers, coming off his great run at Concord, had a lot going for him coming into Ace. 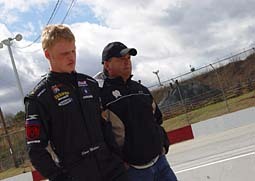 But when the engine expired in his #29, the younger Rogers brother had to watch the race from the infield. Talking to Matt Carter at the end of the race it was evident that Ace wasn't his favorite race track. Last year's Pro Cup Rookie sensation traded a lot of paint on the tight track this year, and survived the mess for a 12th place finish. “It was pretty rough. I hit George Brunnhoelzl there on the restart there and everybody got jammed up. I have to apologize for that because I did not mean to do that. Then, I kept getting under Garvey and got into him a few times too. Hobgood chalked it up to Sarvis not knowing he was there. But it wasn't just Sarvis that was unhappy with Hobgood after the night was over. “We were up there going for seventh and Jake Hobgood did his normal deal there,” said Matt Carter. “He ran a whole race and wrecked I think four cars tonight. He hit somebody and I got inside of him. Then he just turned left as hard as he could and just spun himself out. It cut a right front tire and that put us further in the back. 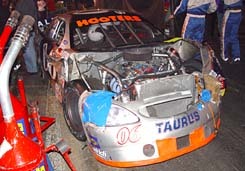 Hobgood stood with his family at the end of the night next to his torn-up racecar. He was disappointed but at the same time satisfied with the progress he has made in the series. 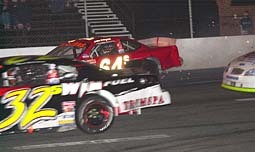 Hobgood's #64 showed signs of all the contact and the vicious hit with the wall that ended the night (51photo). Bobby Gill was on top at Ace, and didn't pit when everyone else did. That was the first thing that put him behind. Then after the 06 pitted he was the innocent victim of a crash in front of him. The Crash tore up his car pretty extensively. 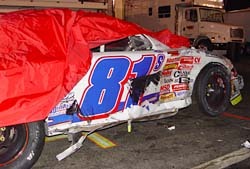 But the damage was mostly cosmetic, and the ravaged racecar returned to the race and was on the move. Gill, with a car looking like it had been through a shredder, stormed thought the field and was a contender yet again. But the damage is what eventually did him in. Gill limped to a 15th place finish. Race fans like to sit on the top-row and might consider that the best seat in the house. Some paid money for VIP suites to watch the Pro Cup race at Ace. But arguably the man with the best seat in the house was Mark McFarland. After a hard fought battle with Jay Folgeman, he watched Jay and Jody Lavender fight for the win out of his front windshield. “I had a good seat to watch the race,” said McFarland. “It was just good being up there and having a shot at the win. I was hoping they would get together. I backed off there to give them some room so I would know which way to go. “They were getting on each other pretty good there. They are both good racecar driver though and they hung on to it. McFarland not only had a great seat, he had a great day overall taking the pole in qualifying and a third place finish. It was a wild race if you were anywhere on the track at Ace. Just ask Mike Garvey, who ducked and dodged a lot of the carnage and watched a spectacular finish from the fourth spot. Jody Lavender was pumped after winning his first Pro Cup race. During all the celebration and picture taking and interviews, Lavender kept trying to reach for his phone. “I was ready to call my girlfriend there," said Lavender. "I love her to death and she has supported me 100%. If there is a biggest fan of mine, it's her. She's been behind me and is wonderful. She wasn't here to see it. (Jody's girlfriend was home in Mooresville, North Carolina). She told me I was going to win the race now that she wasn't here. I wanted so bad to win a race with her here." 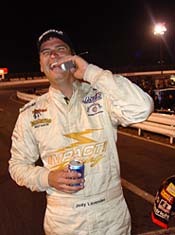 But as the celebration faded and the Hooters Girls had left victory lane, Lavender was still trying to call his girl. 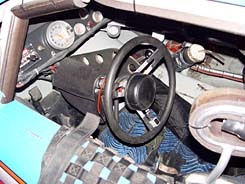 Sarvis' nose was damaged as a result of the incident with Hobgood. (Kathy Bond photo). Matt Carter's #22 battles George Brunnhoelzl's #20. (Kathy Bonb photo).